E's Van's RV-14A: First Flight Prep: FAA Inspection. I can fly. First Flight Prep: FAA Inspection. I can fly. On 7-Nov-17, three FAA Aviation Safety Inspectors came to my hangar and completed their inspection of my aircraft, paper work and builder's log files, images and videos. As of 9-Nov-17 my aircraft is legally permitted to fly. The FAA no longer provides "pink slips". 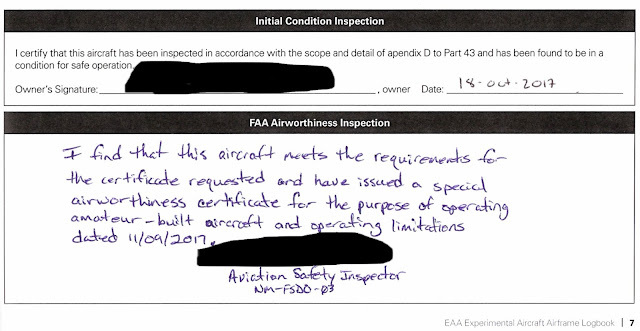 The airworthiness certificate is now provided on 8.5"x11" card stock and is part of the operating limitations. This is FAA Form 8130-7 (11/2016). It is a four page document, which includes a description of the approved flight test area (including permitted airports of use), that must remain in the aircraft during operations per CFR §91.203(b). The certificate shown above is cropped from that document. The official logbook entries are below. And I can legally perform my own maintenance. They put my model as RV-14/A rather than RV-14A. When I pointed this out to one of the inspectors, he said "we're going to let that slide for now." Soon these seats will be occupied. Following placement of the top cowl half, this bad boy is ready to go. 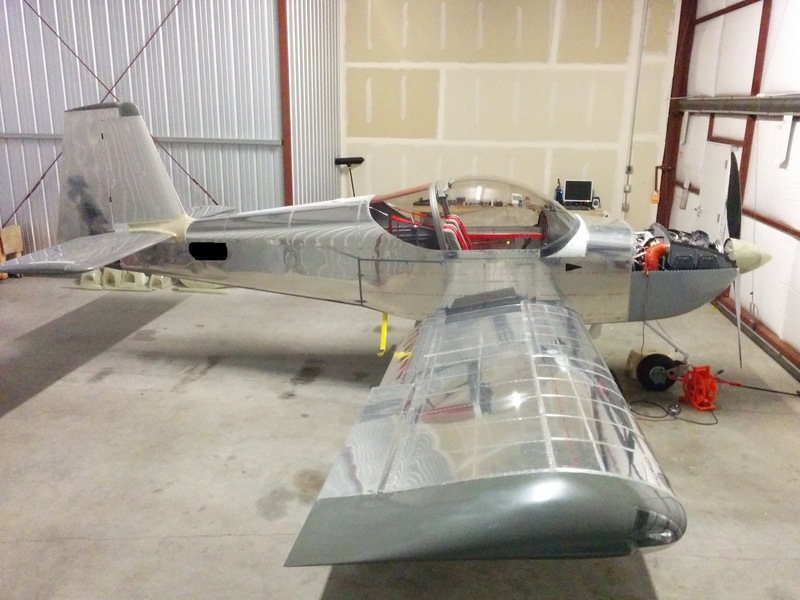 The next posts will detail first and subsequent flight experiences. Congratulations! An outstanding accomplishment especially given where you started from in 2013. Looking forward to the post on the momentous occasion of your first flight. Wait a couple of weeks and you could be Van’s first flight No. 10,000! Congrats! Please keep posting at least during the test phase. Avionics: Intercom output level for recording.